Successfully Added 720P HD In-Car DVR with 2 Inch LCD Display and Night Vision (4GB) to your Shopping Cart. 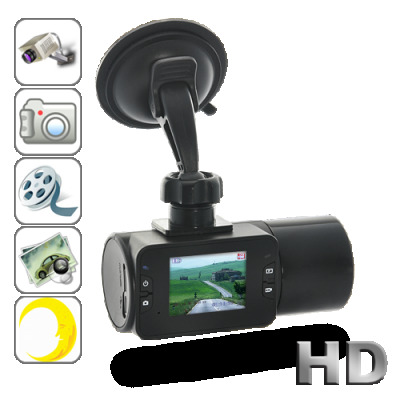 Primarily designed to be mounted on a car dashboard or windshield, this high quality HD video recorder with 2.0 inch LCD screen and night vision function enables you to easily capture video of road situations. Common uses include: insurance purposes, court evidence, capturing an officer’s abusive behavior or just plain fun! Recording 720P HD videos, this is your ideal choice for an in-car DVR. Heading on a road trip with your family or friends? Simply mount this mini DVR on your windshield and catch what you see on the road: breathtaking views, interesting events, etc. With the included free 4GB micro SD card, you can record hours of high quality videos. Best of all, with the powerful night vision functionality, this is one DVR that works all day and all night. Amazing video quality, easy to use and highly convenient. All this at a wholesale price that simply cannot be found elsewhere on the market. Order now while supplies last and we’ll even include a 12 month warranty and ship your order out within 24 hours. Brought to you by your source for low price high quality electronics, Chinavasion. Easy to set up: simply hook up to the mounting plate, attach it to the windshield and you are ready to go. With this product, if a car accident happens, you will have a clear and detailed video that you can proudly present in your defense and put the blame on the bad guy. Yes, you can also charge through the included USB cable.